The Hrvatski Kinoloski Savez (HKS) is the supreme Croatian cynological organisation on a national level. It was founded in 1891 due to the social need for professional and systematic care of the dogs. Nowadays, it consists of 137 members; kennel clubs (associations) and breed clubs from all parts of Croatia. HKS works as a non-profit, non-governmental organisation whose main goal is to promote cynology through breeding purebred dogs, preparation and organisation of international activities with other cynological organisations in the world, taking care for dog health and for the improvement of relations between people and dogs, the recognition as well as protection of the rights of its members. 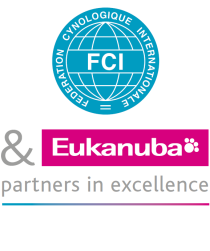 HKS issues internationally recognised pedigrees and cares about education of canine judges in accordance with the rules of the FCI. The Croatian Kennel Club, in accordance with the Law of Hunting and Republic of Croatia’s Animal Protection Act, is authorised to issue certificates of hunting usability for hunting dogs or conduction of tests and exams of socialisation that are essential for keeping certain dog breeds. There are more than 12,000 puppies registered into the Croatian studbook each year, of which more than 20 % belong to the Croatian native breeds. The Croatian Kennel Club is mostly proud of and takes special care of Croatian native breeds. This is visible through the numerous benefits regarding events and breeding, as well as their regular presentation at the major international cynological events. The Croatian Kennel Club and its associations organise more than 500 events per year. More than 50 of them are international. International dog shows in Croatia are annually entered by 15,000 to 20,000 dogs. They are of extreme international character, with exhibitors from more than 30 countries. Posavaz hound is named after the Posavina, an area along the Sava River. As most of our native breeds, it is mentioned in the documents of Diocese of Djakovo in 14th century. It is considered that it originates from the ancient Pannonian pointers that Croats found in this region. The oldest records describe Posavaz Hound as reddish dog with short hair, about 60 cm tall, with white markings on the forehead, neck, legs and tail, which is used to hunt all sorts of wild animals. It was expanded throughout whole Croatia. The breed was officially recognised in 1948. Today, it is described as a medium size dog, lightly built, very active and persistent in hunting. The head is pronounced, elongated and occipitally rounded. The ears are flopping while the neck is well muscled and harmoniously connected to the body. Back is straight, tail is tapering towards the tip. Colour is reddish-wheaten with the white markings on head, neck, abdomen, lower parts of the legs and the tip of the tail. It is used in hunting as an extremely diligent hound, because of its great sense of smell and great resistance. Thanks to its mild nature, it can be a family dog. It is particularly attentive and suitable for children. Istrian short and coarse haired hounds were named after the peninsula of Istria. The breeding of these breeds dates back to 14th century. It is considered that they have extended to all Croatian regions, although mostly along the coast of the Adriatic Sea. The manuscript of Bishop Peter Bakić from 1719 described the hounds 45-60 cm tall, short or semi-long white hair with reddish spots on their body, bred mostly in Croatian coastal areas. They are considered the best hunting dogs on the rocky terrain. It is also interesting that this type of dog has been shown on a miniature missal from 1404. Istrian Shorthaired Hound today is described as a medium large, well-constructed dog. The head is elongated, pear shaped with folded ears. The neck is of medium length, back straight and long. The coat is short, shiny and hard; in general, gives the appearance of a powerful animal. The characteristic colour of the breed is white with light brown - orange fields mainly on the head. Height is standardised by 45-55 cm at the withers. Istrian Short-haired Hound is a typical hound, works great as individual, but also in the group. It is particularly functional on hard, rocky and bushy terrain. The breed was officially recognised in 1949. Istrian Coarse-Haired Hound is a harmoniously built and sturdy dog, a bit robust-looking. It has a harsh hair long 5-10 cm. By constitution is slightly larger and heavier than the Shorthaired variety, with a strong head that is covered with harsh moustache on muzzle. Height is from 48-58 cm, and as a breed was officially recognised in 1948. It is used to catch on rocky terrains as hound dog, as well as a bloodhound. Its contribution in breeding has a very important role, as the breed has been used to enrich some other breeds in Italy, Austria and England. Some authors believe that Dalmatian originates from ancient Egypt, while others point out its Mediterranean origins. Named after the province of Dalmatia, it has been sistematically bred in Diocese of Dakovo as guard dog, carriage and horsemen companion, as well as military and hunting dog. According to the bishop Bakic scripts from 1719, breed Canis Dalmaticus has been mainly bred by Croatian aristrocacy, mostly in Dalmatia, for hunting and personal defense in peace and war. During the Napoleon wars, Dalmatians spread all over Europe, even to Great Britain. FCI recognised the Dalmatian in 1955. The breed standard describes him as an intelligent, temperamental, persistent and loyal dog of harmonious structure with characteristic short white hair streaked with black or brown spots. Out of all Croatian hounds, he is the highest with 55 to 60 cm at the withers. In the past it was used for various purposes like military dog that accompanied the horsemen and caused confusion among the enemy's horses, as a hunting dog that was fast-running catching prey, as a personal guard, or even a medieval carriage companion of travelling actor troupes which got even higher attention thanks to these dogs. Today the Dalmatian is used mainly as a companion where it shows another of his characteristics; persistent pursuit of the master. The worldwide popularity of this breed was achieved by W. Disney’s film “101 Dalmatians". Croatian Sheepdog probably arrived with Croats from its original homeland. Breeding of this breed dates back to the era of houses on stilts. Due to its exceptional pastoral and guard characteristics, its modesty and incredible intelligence, this breed has been preserved in its original form to this day by expanding through whole Croatia. The standard was recognised in 1969; the breed is named after the country. Nowadays, in addition to its genetic predispositions of pastoral and shepherd dog, because of its agility, skill and speed, it is used in Agility competition where it achieves outstanding results. Tornjak belongs to a group of big dogs, whose purpose is associated with the traditional pastoral way of farmers’ life in the high mountains. It is assumed that it originates - as all similar breeds - in the Himalayas, then dispersing all over Europe. On an isolated area of the Dalmatian inland and Herzegovina, interbreeding with native species evolved Tornjak as we know it nowadays. By disappearance of many herds, this breed was doomed to extinction. In 1982, Zagreb became a basis for organised breeding, which was made on few dogs left by the former population in the isolated areas. Tornjak is a large and powerful dog, with long and firm hair, mainly white-coloured with dark areas on the head and body. Its height is about 65 to 70 cm, while weighing more than 50 kg. Although large by size, it is extremely tough, durable and modest. It seems to be very relaxed and calm, but can become very determined when defending the trusted flocks. As its name implies, it has always been near its flocks (tor in Croatian means flock), which it protects from attacks of large predators, mostly wolves and bears. A systematic programme for the introduction of Tornjak as natural protection from wolf attacks on the flocks has been conducted in Croatia for a couple of years. The breed standard was recognised in 2007 and is provisionally recognised by the FCI. The Small Međimurje Dog is the breed with most recent recognition. The Croatian Kennel Club officially recognised it as a Croatian native breed in 2010; it is still a long path towards international recognition. It has been bred for over a hundred years in the northwest of the country, in Medjimurje. It is usually seen in rural backyards as a watchdog and hunter of harmful rodents. Because of these characteristics, the breeding is increasing on modern farms. Because of its size, it is suitable for breeding in urban environment too. It belongs to the lupoid type, with erect ears; its height is around 30 cm and its hair is straight, hard, of short or medium length. There are different colours, the most common combinations being brown, black, white and grey. It is very devoted to its owner and family. It is also affectionate and playful in contact with children. It is very intelligent and impeccably performs verbal commands. Although the Croatian Kennel Club is a relatively small canine organisation, it is extremely proud of all achievements of its members. The Croatian Kennel Club will continue to take care of purebred dogs in Croatia, along with improving cynological culture, morality and ethics and strengthening cooperation with state institutions, economy and tourism. The Croatian Kennel club has organised so many great competitions until now! It is prepared for many wonderful to come.